Mines minister Tom Alweendo said the government did not know that Namib Desert Diamonds (Namdia) was a state-owned company, an admission that adds to the suspicions about the formation of the secretive gems company. Alweendo made this remark on Tuesday when The Namibian asked him whether the Namdia directors were going to pay back part of the N$8,1 million they received in contravention of the law. "What happened with Namdia is that there seemed to be no clarity on its status as an SOE. At the time, the interpretation was that they were not a state-owned enterprise, hence the board fees were not in line with government guidelines," Alweendo said. He added that the confusion has been clarified, and that Namdia is now considered a tier three parastatal, which is the category for highly-paid executives and board members. There is evidence that backs up Alweendo's comment. Public enterprises minister Leon Jooste announced a new state-owned entity policy in July 2016, which allowed him to have a bigger say in profit-driven parastatals. Jooste attached a list of all parastatals in the country, but Namdia was missing from it, despite being in operation for more than three months by then. Namdia's 2018 annual report shows that the parastatal that acts like a middleman company has 20 highly paid officials. The report said the 20 officials were paid N$12 million in 2017/18. This is an increase from the N$3 million paid in salaries during 2016/17. Furthermore, the report also indicated that the company spent more than N$3 million on travelling expenses for the past two years. The report also showed an increase in revenue from N$862 million in 2016 to N$1,9 billion in 2017. Alweendo's admission adds to previous reports about concerns in the manner in which former mines minister Obeth Kandjoze secretly started the operations of Namdia - to serve as a diamond sales and marketing arm of the state - in 2016 without announcing its existence. The Namibian raised a red flag in October 2016 about the manner in which Namdia was started. The company was accused by diamond insiders of selling diamonds to Dubai for peanuts. Namdia started operating on 18 April 2016, with Kennedy Hamutenya, the then diamond commissioner, as the acting chief executive officer. Kandjoze then appointed Namdia's directors on 2 August 2016 for a three-year term, including lawyer Shakespeare Masiza, who is the chairperson; and businesswoman Tania Hangula. It is unclear why Alweendo is claiming that the government did not know whether Namdia was state-owned while the parastatal's board was appointed in consultation with Cabinet, which is headed by president Hage Geingob. The appointment of the board was a surprise to some, especially since the government usually announces heads of state-owned enterprises such as board directors and chief executive officers. But in this case, the state remained tight-lipped on the critical aspects of this company until The Namibian enquired about it. The Namibian reported a few weeks after Namdia started operating that it had sold diamonds for US$500 (around N$7 100) per carat. The same diamonds were then resold for US$2 500 (N$35 600) per carat. Sources in the diamond industry suspected that some Namibians connected to power were benefiting from the cheap sale of Namdia diamonds, effectively making the parastatal their cash-cow. 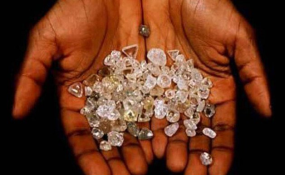 Three people briefed about this matter said several officials close to Namdia reported to Alweendo incidents of corruption and the continued underselling of Namdia diamonds. Namdia's annual report released last week shows that the board of directors were paid N$8,1 million from 2016 to 2018. The Government Gazette, published in April this year, outlined the guidelines on how to reward board members and directors. According to the gazette, the executive chairperson in tier three state-owned entities such as Namdia should receive a maximum of N$104 100 per year, while an executive director will receive a maximum amount N$85 000 annually. With regards to the sitting allowances, the executive chairpersons of tier three SOEs are to be paid a maximum of N$57 500 per annum, while executive directors get a maximum of N$32 500 (assuming four meetings per annum), stated the gazette. These guidelines were not adhered to by Namdia. Namdia board chairperson Shakespeare Masiza got N$824 000 in the 2018 financial year. Other board members who benefitted in 2018 include Venondjo Maharero (N$671 000), Bonny Konjore (N$666 000), chief legal adviser in the attorney general's office Chris Nghaamwa (N$600 000), Lorentha Harases (N$600 000), Tania Hangula (N$582 000) and Florentia Amuenje N$185 000. Alweendo did not respond to questions whether he will demand that the directors pay back the money, as he did with Namcor directors. Namdia paid the government N$50 million as a dividend, but diamond insiders widely see that payment as justification for the company's questionable existence.